How to use common system components to build your functionality. Welcome back! In the last lesson, we talked about the powerful core features you’ll encounter as you build and maintain your app that are accessible via the side menu in the App Dashboard. In this lesson, we’ll go over the common components you’ll encounter in the feature content editor when you’re building and managing the content of your app. In an effort to make your user experience as consistent and easy as possible, we’ve created some common components that you’ll see throughout the platform. Let’s go over some of the most commonly used ones. The Text WYSIWYG (which stands for What You See Is What You Get) is a powerful tool that allows you to add not only text, but also embed images, videos, forms, and insert hyperlinks. It’s a great way to add variety and enhanced functionality to your app! You can learn more about this versatile element of our system here. 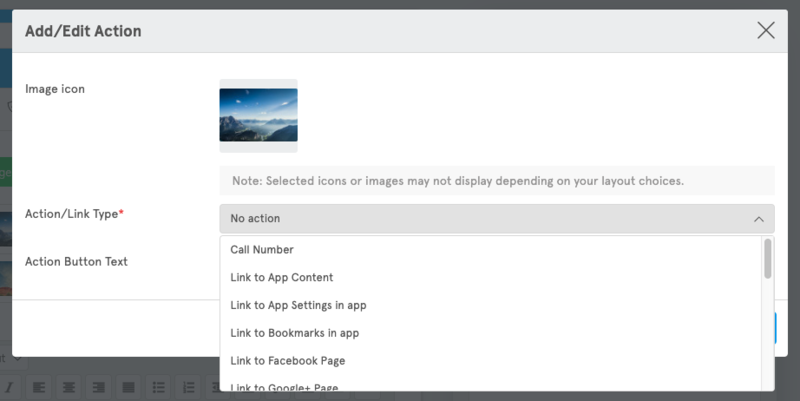 You’ll see the Action Builder in a number of elements of our system such as, but not limited to, the image carousel, push notifications, the contact section of marketplace features, and the footer menu. It enables you to link these components to a variety of actions such as taking your users to a specific marketplace feature in the app, calling a phone number, sending a text message, sending an email, linking to a map, linking to a webpage, and more. You can learn more about the Action Builder here. The Feature Icon: clicking on this will allow you to change the image or icon for your feature. The Feature Title: Changing this will change what displays as the feature’s name for your users when they see it in folders and the side menu, or whenever the feature is referenced. Help Button: Clicking on the Help button will take you to our knowledge base with a dedicated article to teach you how to use that feature. The Content Tab: This is where you will edit the content of your feature. 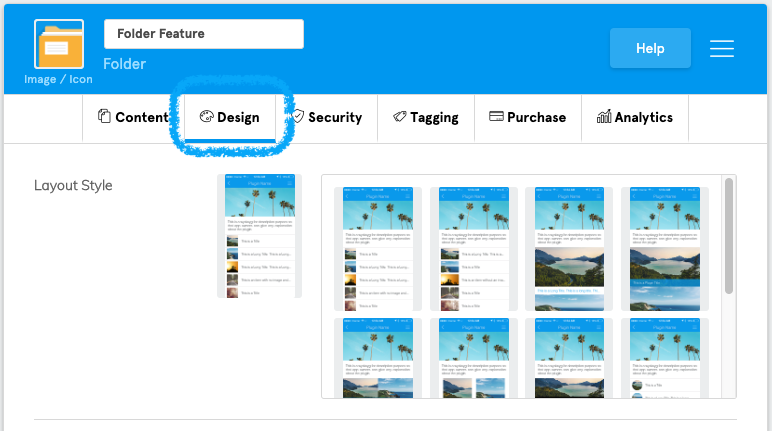 The Design Tab: This is where you can change the layout of your feature. The Analytics Tab: This is where you can see how many users have accessed this specific feature in total and over time. The Image Carousel: This is a rotating image gallery of sorts that allows you to link your images to a specific action using our action builder that displays above the content of the app. You can learn more about the Image Carousel here. Using this in conjunction with the Media Library, you can upload and edit your own images, or choose from thousands of our stock images that are ready to use and pre-licensed for both personal and commercial use. In addition to these components, there are several advanced features that are available when you upgrade your subscription to a paid plan. The Security Tab: This is an advanced feature that allows you to restrict access to specific users by requiring that they login and have tags assigned to them in order to gain access to that feature. Whether you’re building an internal communications app or whether you want restrict certain features to certain customers, this is a great tool to use for that purpose! 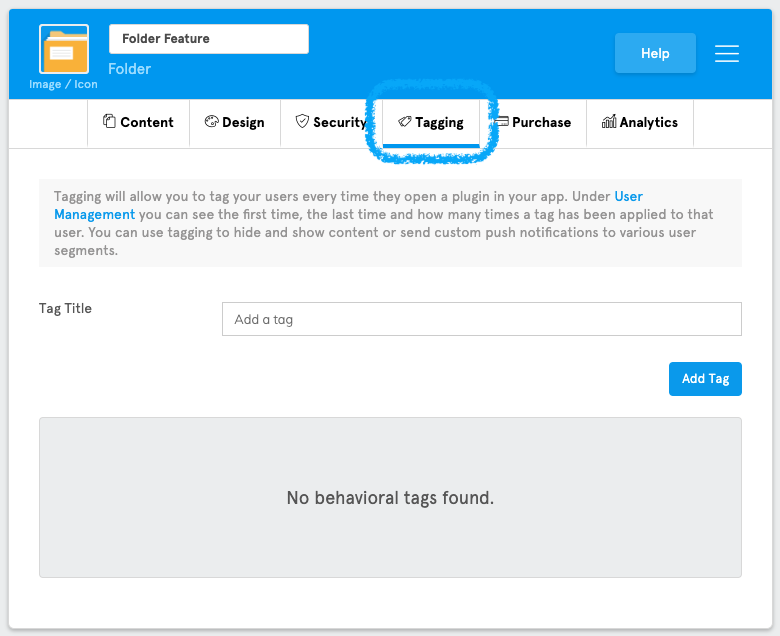 The Tagging Tab: This is an advanced feature where you can automatically assign tags to users when they enter a feature. You can then use these tags when sending targeted push notifications or to gather data about what your users are interested in. 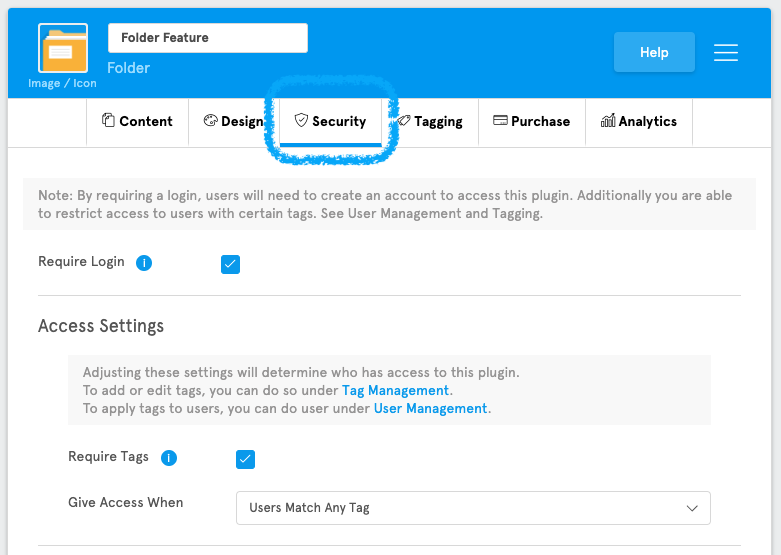 Note: Unlike the Security tab, the Tagging tab implements user tags for analytical and identifying purposes, not security. The Purchase Tab: This is an advanced feature where you can set up a required in-app purchase or subscription that users will need to purchase in order to gain access to that feature. Now that you know what the core and common components of the system are, you’re ready to build your app. If you started with a template, that will give you a solid framework to simply adjust the content and artwork within it. Or, if you’d like our amazing Pro Service team to build your app, click here and we’d be happy to discuss your app idea with you! Now that you know how to build your app, in the next lesson we’ll talk about how to get it published and live on the App Store and Google Play.